After playing it cool for a few years, RIM has apparently decided that there's something to this touchscreen phone lark after all, releasing a budget all-touch device in the shape of the BlackBerry Curve 9380. In the last few months we've seen a touchscreen added to the Bold in the form of the BlackBerry Bold 9900, an update to the Torch line in the BlackBerry Torch 9810, and a new, all-touch addition to the Torch family in the BlackBerry Torch 9860. Now it's the Curve family's turn, even though we thought it was doing fine without touch in our BlackBerry Curve 9360 review. 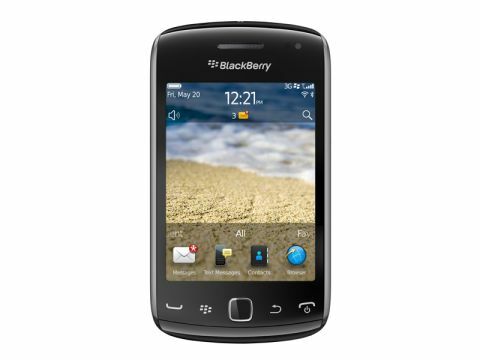 Instead of taking the Bold route and adding touch capability to the screen above the keyboard, RIM has been somewhat more aggressive with the BlackBerry Curve 9380. The keyboard's gone completely, in favour of a 3.2-inch 360 x 480 touchscreen. This puts it far closer to the Torch 9860 than its Curve brethren on the outside, although it's rather more like the Curve 9360 when it comes to the internals. Instead of the Torch's nippy 1.2GHz processor, the Curve 9380 ticks along at 806MHz, though there's a reasonable 512MB of RAM for multitasking. These power the new BlackBerry OS 7, as seen on all the latest handsets from RIM, and also featuring on the Bold 9790. In its other internals, the BlackBerry Curve 9380 is very similar to the Curve 9360 (erm, do your best to keep up with the numbers, though nobody will blame you for getting a little confused). There's a 5MP camera with VGA video recording and an LED flash, Wi-Fi, GPS support, Bluetooth 2.1, microSD card support and NFC built in. It's even essentially the same size and weight as the Curve 9360: 109 x 60 x 11.2mm and 98g - a total difference of 0.2 mm in depth and 1g in weight. The Curve 9380 feels really light in the hand compared to the 150+g smartphones that are becoming the norm, but it doesn't feel cheap. Yes, it feels like plastic, but there's little give, and we'd trust it to survive a few drops. From the front, the BlackBerry Curve 9380 resembles a smaller version of the Torch 9860, with the same glossy black front and silver edging. The Call, Menu, Back and End buttons at the bottom are part of the main plastic fascia, though, unlike the separate buttons of the Torch 9860. This is, frankly, a mistake. They're much harder to press, and needlessly so. We know RIM loves its buttons, but it could have kept the same sleek look but made them far easier to hit by using touch-sensitive buttons. The optical trackpad has no such issues, however. The BlackBerry Curve 9380's screen is nice and bright, with nice natural colours and excellent viewing angles. It is, however quite low resolution. It's actually got the same number of pixels as the Curve 9360's screen, but that was only 2.88 inches, compared to 3.2 inches here. It's less than half the resolution of the Torch 9860, and is lower than the Torch 9810, which also has a 3.2-inch screen. The result is that icons and text are often noticeably pixelated, which makes for a less pleasant experience in the browser and apps like Twitter. It's still readable, of course, but just makes for a more underwhelming experience. On the right-hand side of the BlackBerry Curve 9380 is the volume rocker with mute key, and the Convenience key. Because of the small size of the Curve, we found the Convenience key to be slightly too far down, and a little stiff. Pressing it one-handed actually caused the phone to slip out of our grasp a couple of times. We'd prefer if it were slightly further up. On the left side is the micro USB port, while the top houses a big Lock key built into the curved fascia and the 3.5mm headphone jack. The rear is mostly glossy black plastic, which picks up fingerprints and grease at an alarmingly quick rate. At the top are the camera lens and LED flash. You remove the back plate by finding the tiny little dent near the micro USB port and popping the back off with a fingernail. From there, you can add your microSD card slot, or remove the battery, where you'll find the SIM card slot.